Telangana Chief Minister K Chandrasekhar Rao met the Governor and informed him of the cabinet's decision to dissolve the state assembly. After days of suspense, Telangana Chief Minister K Chandrasekhar Rao asked the Governor today to dissolve the assembly, clearing the decks for early elections in the state. Governor ESL Narasimhan has accepted his recommendation. The move will push forward the elections from the middle of 2019 to the end of this year. Till then, Mr Rao will stay on as the caretaker Chief Minister. Mr Rao has been hinting at such a step for weeks, but stopped short of making the announcement. Expectations rose to a fever pitch on Sunday, when the party held a huge rally in Ranga Reddy district, but the Chief Minister disappointed all, merely saying he has been empowered to take a decision. The Chief Minister, popularly known as KCR, has already announced the names of 100 candidates. He will formally launch the party's election campaign with a public meeting at Husnabad in Siddipet district on Friday. Christened "Prajala Aasirwada Sabha", this will be the first of 100 public meetings planned by TRS over the next 50 days. Mr Rao's push for early elections is seen as a move to keep his voter base together. Had the assembly completed the full term, it would have clashed with the general elections and the focus would have shifted from local issues. BJP sources told NDTV that the Chief Minister did not wish to go to polls in the middle of a Lok Sabha election that would be about Prime Minister Narendra Modi. Denying the possibility of any tie-up with KCR, the BJP leader said it would be a triangular contest, where the BJP will contest all 117 seats. The leader however admitted that Mr Rao's party, the Telangana Rashtra Samithi, was not ideologically opposed to the BJP and there was a possibility that it could tie-up with "any party which is dominant in the Centre" after the elections. There has been a perception lately that Mr Rao has entered a secret understanding with the BJP. It has been fuelled by a series of meetings between the Chief Minister and Prime Minister Narendra Modi, followed by a vote for the government in the recent Rajya Sabha deputy chairman election. The perception has been fanned the Congress, which is trying to capture power in the state. 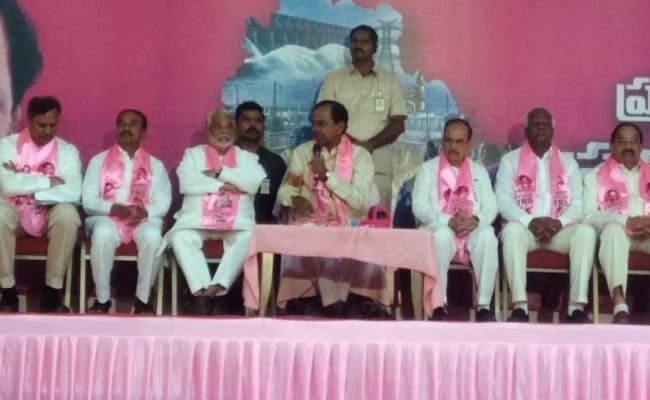 The TRS chief, who has a large support base among a huge section of the state's Muslim voters, has repeatedly denied any understanding with the BJP. He has also been pitching for a non-Congress-non-BJP Federal Front for months.